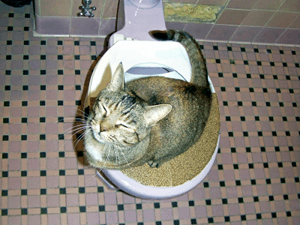 I trained our cat to use the toilet. Then I wrote an article for Make Magazine all about how to do it yourself!! I’ve been a big fan of Make since it first turned up, so this was a big thrill. Of course, my cat then got a urinary tract infection because she didn’t like using the toilet. I’m sure there’s a lesson in there somewhere.